Featuring a full orchestra and chorus, this album of triumphant classics includes 'And Can It Be', 'Rejoice The Lord is King' and 'Love Divine.' A wonderful tribute to one of the best hymn writers of all time. Includes a biography of Charles Wesley. 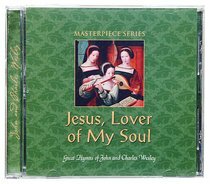 About "Jesus Lover of My Soul (Masterpiece Series)"
John Wesley (1703-1791), and 18th-century Anglican clergyman and Christian theologian, was an early leader in the Methodist movement. Wesley's greatest theological achievement was his promotion of what he termed "Christian perfection," or holiness of heart and life.